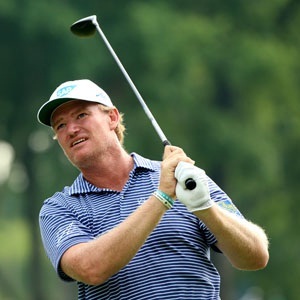 Augusta - Ernie Els turned back the clock with a five-under 67 to sit three shots off the lead after the first round of the Masters on Thursday, rekindling belief a long predicted green jacket is still in his future. Playing in his 21st Masters, the two-times runner-up at Augusta National surged into contention with his lowest opening round here by mixing five birdies and an eagle with two bogeys for a four-way share of second place. "I think it's well documented that I still feel like I get something out of it," said the 45-year-old Els. "You know, these guys are good. I've got a lot of talent but you've got to get the most out of it now, we're running out of time. "But I'll be up for it." Els, who is widely known as the 'Big Easy' because of his smooth swing and generally laidback demeanor, had fallen on hard times around Augusta. After 18 consecutive invitations to the Masters, Els failed to qualify for the tournament in 2012. Following a gut-wrenching second place finish to Phil Mickelson in 2004, his love affair with Augusta faded. Els missed the cut four of the next 10 years, failed to qualify in 2012 and managed to crack the top 15 only once. "I was trying to wipe (2004) under the carpet that I wanted this one so badly for so many years; definitely, there was something going on," said Els. "Kind of, you get fed up with yourself. "I felt that I left shots out there in that span, that five-, six-year span. "So a little frustration set in there." The South African made his debut at Augusta National in 1994 and made such an impression on playing partner Ben Crenshaw that the two-time Masters champion assured Els he too would one day earn a green jacket. Els went on to enjoy a Hall of Fame career capturing two British Open and U.S. Open titles each but the Masters has also remained tantalizingly beyond his grasp. "I finished eighth and really thought it was on. But it didn't quite happen."